Pressed from a variety of materials, including brass, steel and stainless steel, our classic plates offer timeless style. 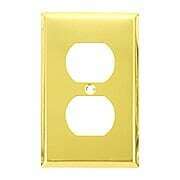 This line of durable switch plates and outlet covers comes in an array of popular finishes, and includes all of the essential configurations, from toggle, to GFI and push button. With its classic bevel-edged design, this single toggle switchplate goes with everything from Colonial to Mid-Century Modern. 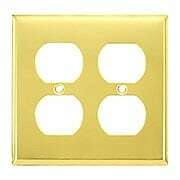 Crafted from economical pressed brass or steel, it comes in a wonderful array of period and modern finishes. With its classic bevel-edged design, this single push button switchplate goes with everything from Colonial to Mid-Century Modern. Crafted from economical pressed brass or steel, it comes in a wonderful array of period and modern finishes. 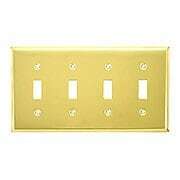 With its classic bevel-edged design, this GFI coverplate goes with everything from Colonial to Mid-Century Modern. Crafted from economical pressed brass or steel, it comes in a wonderful array of period and modern finishes. With its classic bevel-edged design, this cable jack coverplate goes with everything from Colonial to Mid-Century Modern. 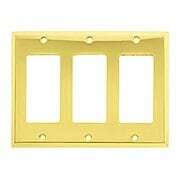 Crafted from economical pressed brass or steel, it comes in a wonderful array of period and modern finishes. With its classic bevel-edged design, this double toggle switchplate goes with everything from Colonial to Mid-Century Modern. Crafted from economical pressed brass or steel, it comes in a wonderful array of period and modern finishes. 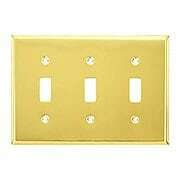 With its classic bevel-edged design, this double outlet coverplate goes with everything from Colonial to Mid-Century Modern. 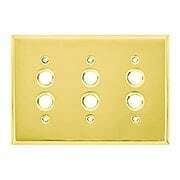 Crafted from economical pressed brass or steel, it comes in a wonderful array of period and modern finishes. With its classic bevel-edged design, this double push button switchplate goes with everything from Colonial to Mid-Century Modern. Crafted from economical pressed brass or steel, it comes in a wonderful array of period and modern finishes. 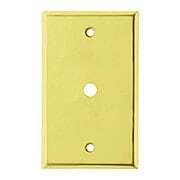 With its classic bevel-edged design, this double GFI coverplate goes with everything from Colonial to Mid-Century Modern. 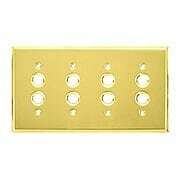 Crafted from economical pressed brass or steel, it comes in a wonderful array of period and modern finishes. With its classic bevel-edged design, the Classic Push Button Switch / /Duplex Cover Plate goes with everything from Colonial to Mid-Century Modern. Crafted from economical pressed brass or steel, it comes in a wonderful array of period and modern finishes. 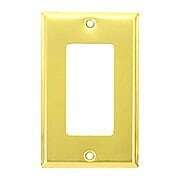 With its classic bevel-edged design, the Classic Push Button Switch / GFI Dimmer Cover Plate goes with everything from Colonial to Mid-Century Modern. Crafted from economical pressed brass or steel, it comes in a wonderful array of period and modern finishes. With its classic bevel-edged design, the Classic Push Button / Rotary Dimmer Combo Switchplate goes with everything from Colonial to Mid-Century Modern. Crafted from economical pressed brass or steel, it comes in a wonderful array of period and modern finishes. 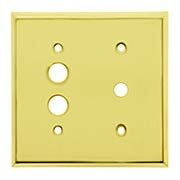 With its classic bevel-edged design, this triple toggle switchplate goes with everything from Colonial to Mid-Century Modern. 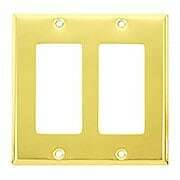 Crafted from economical pressed brass or steel, it comes in a wonderful array of period and modern finishes. 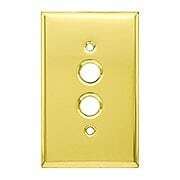 With its classic bevel-edged design, this triple push button switchplate goes with everything from Colonial to Mid-Century Modern. 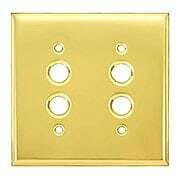 Crafted from economical pressed brass or steel, it comes in a wonderful array of period and modern finishes. 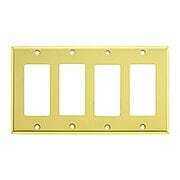 With its classic bevel-edged design, this triple GFI coverplate goes with everything from Colonial to Mid-Century Modern. 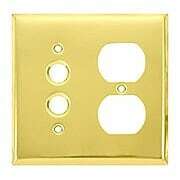 Crafted from economical pressed brass or steel, it comes in a wonderful array of period and modern finishes. With its classic bevel-edged design, this four gang toggle switchplate goes with everything from Colonial to Mid-Century Modern. Crafted from economical pressed brass or steel, it comes in a wonderful array of period and modern finishes. With its classic bevel-edged design, this four gang push button switchplate goes with everything from Colonial to Mid-Century Modern. Crafted from economical pressed brass or steel, it comes in a wonderful array of period and modern finishes. 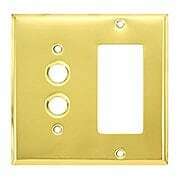 With its classic bevel-edged design, this four gang GFI coverplate goes with everything from Colonial to Mid-Century Modern. 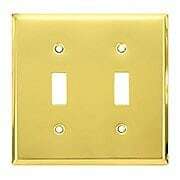 Crafted from economical pressed brass or steel, it comes in a wonderful array of period and modern finishes.